Chroma's 17020 is a high precision system specifically designed for secondary battery modules and pack tests. Accurate sources and measurements ensure the test quality that is suitable to perform repetitive and reliable tests that are crucial for battery modules / packs, for both incoming or outgoing inspections as well as capacity, performance, production and qualification testing. 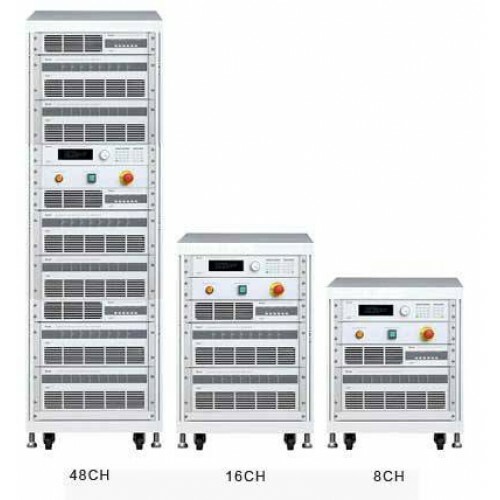 Chroma's 17020 system architecture offers regenerative discharge designed to recycle the electric energy sourced by the battery module ei ther back to the channel s in the sys tem performing a charging function or to the utility mains in the most energy efficient manner. This feature saves electricity, reduces the facilities thermal foot print and provides a green solution by reducing the environmental impact on our planet. Chroma's 17020 system is equipped with multiple independent channels to support dedicated charge / discharge tests, on multiple battery modules / packs, each with discrete test characteristics. The channels can easily be paralleled to support higher current requirements. This feature provides the ultimate flexibility between high channel count and high current testing. Chroma's 17020 system has exible programming functions and may be operated with Chroma's powerful Battery Pro software. Battery Pro utilizes the system to create cycling tests from basic charge or discharge to complex drive cycle testing for each channel or channel groups. A thermal chamber control can be integrated into a profile and triggered by time or test results yielding a dynamic profile. Battery Pro's features allows quick and intuitive test development to eliminate the need of tedious scripting or programming by a software engineer. There are multiple safety features including Battery Polarity Check, Over Voltage Protection, Over Current Protection check and Over Temperature Protection to ensure protected charge / discharge testing. In the unlikely event of power or computer communication loss, the data is securely stored in the system, on a non-volatile memory, protecting against potential data loss and allowing for continuous ow after restart. The battery pack always is used at quick and un-regular current condition. The system simulates the real condition on battery pack by working condition simulator. Import dynamic charge/discharge power or current waveforms to simulate the DRIVE CYCLE or the actual application. There are 720,000 points of driving profile memory to save the waveform profile in each channel. Voltage/current sampling rate of 50kHz used for calculations of capacity ratings in dynamic waveform mode. The dimensions of a regenerative system is smaller compared to a system that has to dissipate energy. Continuous charge and discharge transition: No time delay to transit from charge to discharge. The user can verify the battery pack for a design limit. Continuous CC-CV transition: No overshoot current or voltage to damage the battery when transiting CC-CV. The trip time between maximum charge and maximum discharge current is 50ms. Smooth current without overshoot for avoiding to damage the battery. Temperature measured for each channel within the range of 0~90℃±2℃. 4 sets of measurements (Max) per channel to measure the battery surface temperature. For battery pack design, the charge and discharge connections are independent. Users can set 17020's channels with independent charge / discharge connections to isolate each operation independently. 60 min of temporary data storage when sampling time is 1 sec. Save the test settings to resume after power failure is recovered. The 17020 Test system is specifically designed to meet the various requirements for testing secondary battery packs with high safety and stability. Charge and discharge protection aborts tests when abnormal conditions are detected. Data loss, storage and recovery are protected against power failure. Icon Manager: Test status of each channel is managed through different icons, easy to read and understand. Authority management: It sets the user's authority for operation. Fault record tracking: It records the abnormal state of each channel independently. Report analysis Function: Users can create customized reports such as life-cycle report, Q (AH)-V(V) report, V(V)/I(A)/T( ℃)-time report⋯etc through the user-defined X and Y axis parameters. BMS communication interface：Collect the BMS data to controls the charge/ discharge profile and protection setting. Data logger： Collect the data logger to controls the charge/ discharge profile and protection setting. 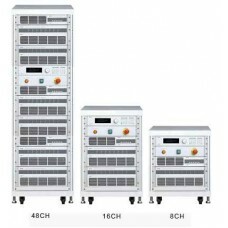 Thermal Chambers：It synchronize temperature control with charge/discharge profile. No matter how many channels are active, the data rate can be as fast as 5 samples per second per channel.